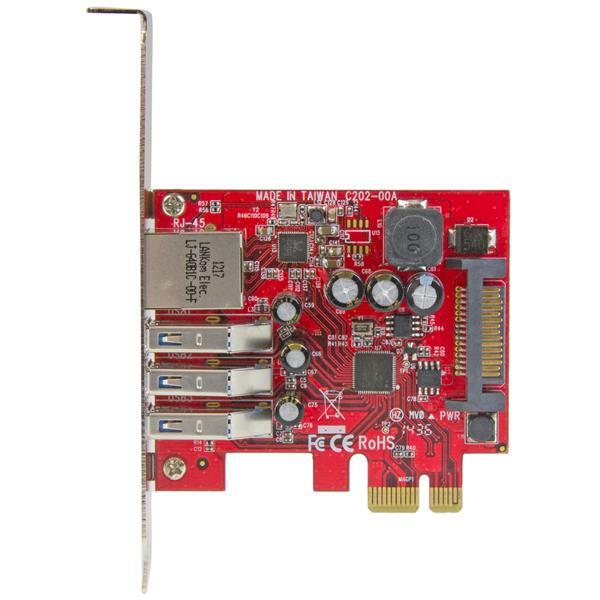 This PCIe USB 3.0 card couples your peripheral and network connections into a single, scalable solution. 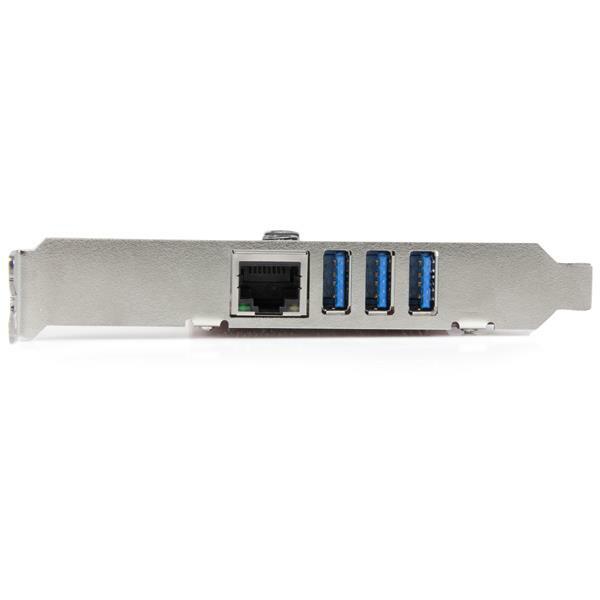 By combining three USB 3.0 ports and one RJ45 port onto a single card, you only need a single PCIe slot for installation, which lets you free up space for other add-ons or upgrades and get more out of your desktop or server. If you have separate cards for your USB and network connections, this versatile card overcomes the aggravation of running out of PCIe slots while helping to reduce clutter inside your PC. 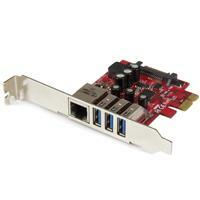 This dual-purpose card is perfect for building or upgrading your computer. It helps you save money by avoiding the additional costs of purchasing separate USB 3.0 and Gigabit Ethernet adapters. You can rest assured this card will fit in your small form-factor system, if needed. It features a dual-profile design that makes it easy to install in either standard or low-profile cases. The combo card makes it easy to connect peripherals such as your external hard drives or mobile devices. Plus, it’s backward compatible with USB 2.0 and 1.x, so you won’t have to replace all of your existing USB devices. Functioning as a network adapter, the card delivers wired network access in locations where Wi-Fi® is unavailable or unreliable. Support for advanced features such as jumbo frames and VLAN tagging means you can optimize network traffic as needed. This high-performance SuperSpeed USB 3.0 adapter card supports data transfer rates up to 5 Gbps and is enhanced with UASP support, which can perform ~70% faster read speed and 40% faster write speed over traditional USB 3.0, when paired with a UASP-enabled enclosure. The PEXUSB3S3GE is backed by a StarTech.com 2-year warranty and free lifetime technical support. UASP (USB Attached SCSI Protocol), is supported in Windows 8, 8.1, Server 2012 and Linux kernel 2.6.37 or later. 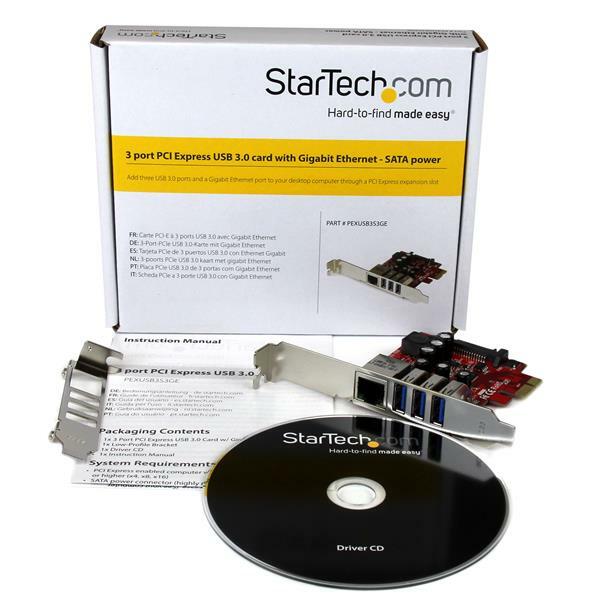 Test results were obtained using an Intel® Ivy Bridge system, StarTech.com add-on USB 3.0 cards, a UASP-enabled StarTech.com enclosure, and a SATA III solid-state drive.